I've seen some movies recently that I feel are worth mention - definitely worth blogging about. Over the last couple of months I've been going a bit more regularly to the movie theatre, by more regularly I mean that I've gone maybe once or twice each month for the last 2 months. 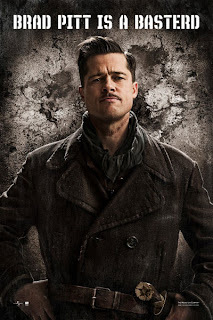 Movies I've seen include District 9, The Time Traveler's Wife, Inglourious Basterds. The Time Traveler's Wife is not blogworthy. The other two I mentioned are. 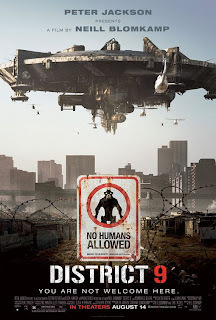 District 9 blew me away. The story seems so real and possible. There are alien movies that are so out there you know you're watching fiction - most of them actually. This one felt real. It felt like it could totally happen. Like it happened. The story of a regular, and kind of dorky guy, who because of crazy circumstances is forced into extraordinary situations. He turns into a serious fighter and a quasi-Rambo. He's a hero, even though he doesn't want to be and he doesn't know how to be. There is less action than you would expect, but definitely more than the characters want. Well written, directed, acted and produced. An example of what people can do when they put their minds to it. So many mediocre movies are made every day that it makes it hard for us to believe that there are still people out there who want to make something they can be proud of. This movie was a masterpiece and should be shown to film students as an example of what can be done without excessive 3D and computer manipulation. All you really need is a good story, and good people to make it. Inglourious Basterds. My sister had told me it was not Tarantino at all and that it was even kind of slow. This comment kind of turned me off and I was totally uninspired to see it. I went anyway and I'm glad I did. It was truly worth the ticket. This may be my favorite Tarantino. It was a fantastic story with a super entertaining cast and very Tarantino production. There are long moments of dialogue that don't feel long because they're so tense. The movie makes you laugh, makes you nervous, and grosses you out. It seriously entertains. I was not expecting to be wowed, so it was a very pleasant surprise. What a great film. If you haven't seen it, I highly recommend you do. There is something to be said about a man who is able to put out a limited number of movies in order to make sure that each one not only represents, but is better than the last. Bravo! The Painted Veil. I saw this one on TV. The story is beautiful and heartbreaking. The cinematography is breathtaking. It takes you on a journey to a far away land. This is the true sign of a good story/movie, when you feel like you're on a journey with them. For two hours I was in China and traveling with them. This is a good story made by people who felt very strongly about what they were doing, and their passion translates perfectly into the film. You can tell this was personal to them and that makes all the difference. It's a love story that leaves a lot of room for discussion as it touches on sensitive, but honest issues without sugar coating or exaggeration. It ends on a disappointing note, but that doesn't change the way I feel about the movie. If I had to sum up what I feel about the movie I would say that it's an honest, passionate love story that will take you on an exotic journey to the Chinese countryside with all the ups and downs that come with it.